Help! I’m Stuck in the Bathroom and I Can’t Get Out! Last month was full of travel. Just as I arrived in San Antonio, Kiefer was headed to Turkey. He called me from the airport. Thoughtsy: You’re blowing off work and flying to Texas to see me? Kiefer: I wish. We got the house. For almost 2 years, Kiefer and I looked at houses. We put offers in on several, and one offer after another was outbid. Rejection again and again. But…finally…we found a cute house; they accepted our offer, and we got the keys last night. Thoughtsy: KIEFER! Help! I’m trapped in the bathroom. The door is stuck. Let me out! Kiefer: Bwahaha! That’s funny. Open the door. Kiefer: Did you lock it? And that’s how we got the first item on our new house’s To-Do List. I can’t believe the new bathroom turned on me like that. Jerk…. If I suddenly stop blogging, you’ll know where I am. Send help. Finally…Everything seems to be coming together. House with more than one bathroom? Check. Baby? Hopefully soon to be checked. I have a confession to make. 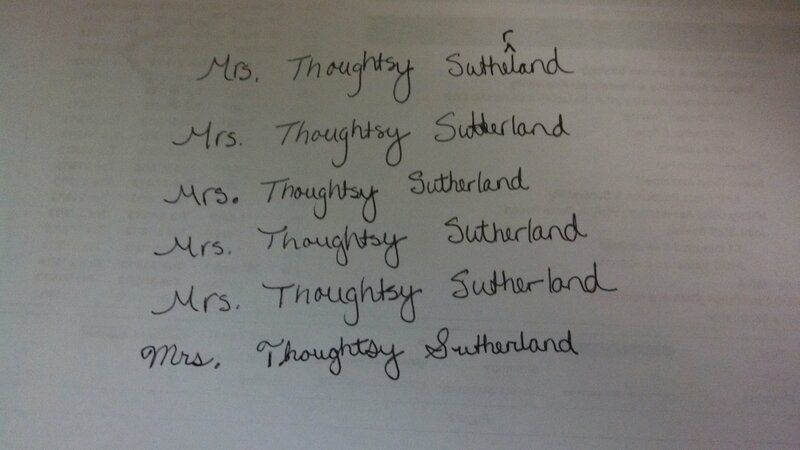 My real name isn’t Thoughtsy Appear. GASP! And Kiefer’s real name isn’t Kiefer Sutherland. DOUBLE GASP! In real life, my last name is 12 letters. 12! That’s long. As a teenager, I dreamed of marrying a man with a short last name, like Smith. Even better: Doe. In real life, Kiefer’s last name is 7 letters. Not as short as “Doe” but I’m willing to compromise. I can’t breathe. It’s all moving so fast. 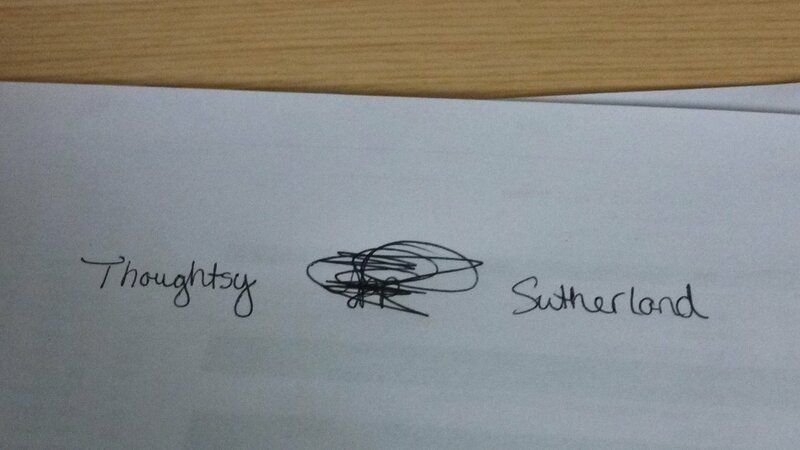 As if that wasn’t enough, Kiefer and I went shopping for wedding bands…and the order is under: Thoughtsy Sutherland. Not only did I start to sign the wrong last name, I pretty much printed the new last name. Dammit…I don’t even remember how to write in cursive. By the time I got to the “n,” I was just done. And I hate the cursive “r.” It looks like the pi symbol. I wish it looked like pie instead. Thoughtsy: I’m still shocked that you actually proposed. Kiefer: Did you like it? I wrote it down. And then I memorized it. Mem-o-riz-ed it. Thoughtsy: Can I have the written version? For the blog. Maybe you could sign it, too. So it would be like a contract. Let’s add in a cupcake clause. Also…I’m going to need you to propose again. Kiefer: I’ll propose to you every day if you want. Thoughtsy: Do I get 4+ years to decide? Kiefer: What are you talking about? I’ve wanted to get married this whole time. You’ve been the hold up. Thoughtsy: ::the “excuse-me” eyebrow raise:: Not. Funny. Kiefer: Fine. But can we get married now? Now? What about now? Thoughtsy: Every time you ask, I’m making you wait an extra month. Kiefer: Well played, Thoughtsy. Well played. The Way to My Heart. 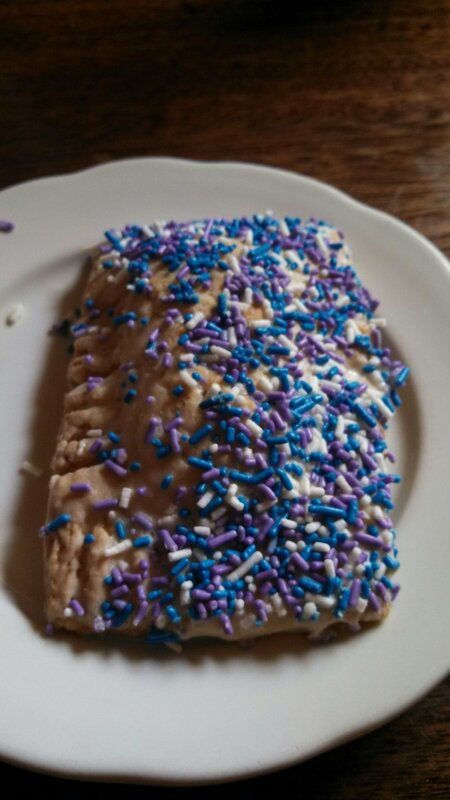 Yes, It Involves a Pop-Tart. After Kiefer proposed, I made him wait for an answer. To get a taste of his own medicine. Don’t worry though. I’m not making you wait any longer. For weeks, I grilled him with my questions, concerns, and every possible scenario I could think of. Kiefer was my heart’s choice, but my head needed reassurance. Then one weekend Kiefer and I headed down to DC’s Ted’s Bulletin for homemade Pop-Tarts. 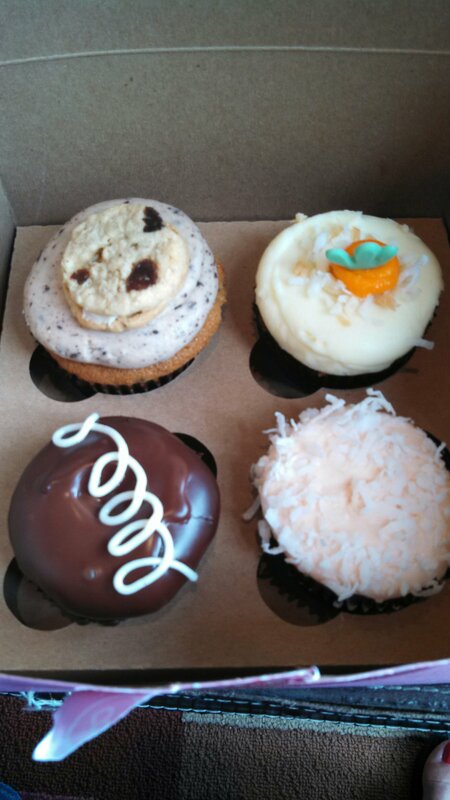 After walking around the Eastern Market for a while, he suggested we eat cupcakes from Buzz Bakery. As we ate cupcakes, I knew. I knew that any man who feed me Pop-Tarts and cupcakes in the same day was the guy for me. We could have Pop-Tarts and cupcakes every day. We’d eat so many that our little babies would have sprinkles for dimples and icing for hair. Kiefer: Hey do you hear what those women are talking about? The women at the next table were planning a wedding. I didn’t hear them because I was busy deciding what was more important: accepting Kiefer’s proposal or eating the last bite of cupcake. Thoughtsy: YES! I mean, no. I don’t know what they’re talking about. Kiefer: Then why did you just say, “Yes?” Wait…. Yes? Favorite Comment From Last Post: ALL OF THEM! For the newbies, here’s the extremely short background to this post. I was with a guy for 4+ years, but he had commitment issues, so I left about 6 months ago. You can read about all that here. Kiefer: I can’t believe how easy this seems for you. Thoughtsy: It’s not easy. I didn’t just wake up one day and decide to leave. Every day you didn’t propose was a day you pushed me away. Part of me hopes one day you’ll show up on my doorstep with a ring, and everything will be ok.
Kiefer: So in a few weeks, not if, but when I show up on your doorstep with a ring…. Thoughtsy: You can’t say that. I’ll just think you’re proposing out of desperation. You have to wait. Aaaaaand…just to make sure I believe you, you should probably have a ring in one hand and plane tickets to Vegas in the other. Blarney: Kiefer wanted to talk to me…about you. He knows he messed up. I believe him. A little over a month ago, Kiefer called me to ask if we could meet. He said it couldn’t wait. Kiefer: I love you. I love your wit. I love how caring you are. I took tomorrow afternoon off so we can go to the Justice of the Peace, and I have tickets to Vegas for next weekend if you want to do that. We could have a wedding for friends and family later…maybe around Halloween since that’s our holiday. I’m sorry I waited so long…. Kiefer: Ozzy Puppy! Leave it! Don’t eat the ring!